A hydroelectric dam collapsed in southeastern Laos, leaving an unknown number of people dead and hundreds missing, state media said Tuesday. Villagers evacuate after the Xepian-Xe Nam Noy hydropower dam collapsed in Attapeu province, Laos July 24, 2018. A hydroelectric dam collapsed in southeastern Laos, leaving an unknown number of people dead and hundreds missing, state media said Tuesday. Rescue efforts were underway as top government officials rushed to the site and public appeals were launched for aid. 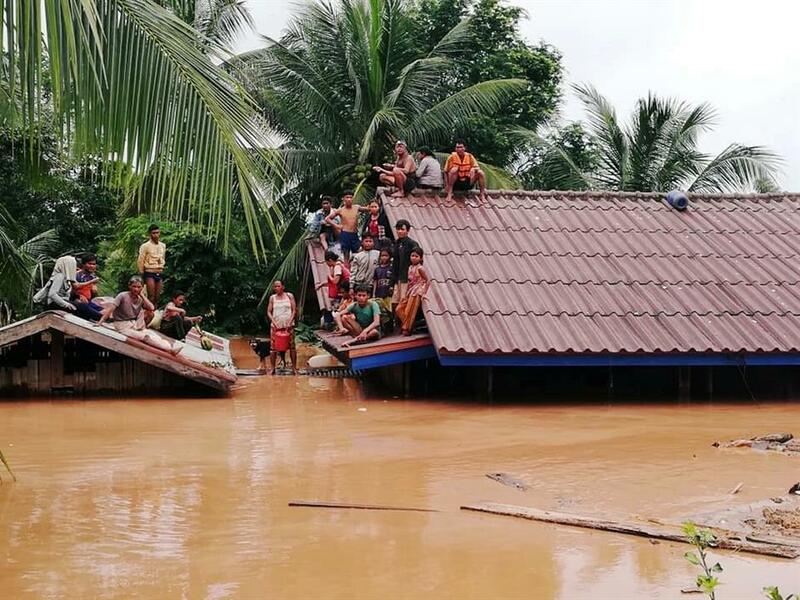 The official Lao news agency KPL said the Xepian-Xe Nam Noy hydropower dam in Attapeu province collapsed Monday evening, releasing cascades of water that swept away houses, flooded villages and made more than 6,600 people homeless. The dam was made by a joint venture led by South Korean companies with Thai and Lao partners, and was still under construction. KPL described the portion that collapsed as a "saddle dam," which is an auxiliary dam used to hold water beyond what is held by the main dam. South Korea's Yonhap News Agency quoted an unidentified official at SK Engineering & Construction, one of the two South Korean partners in the project, as saying rain in the area was triple the usual amount, and one of five auxiliary dams had overflowed. Many areas of Laos have recently been hit by floods from heavy seasonal rains. KPL said the disaster "claimed several human lives" and "left hundreds of people missing," without providing details. Prime Minister Thongloun Sisoulith "suspended the planned monthly meeting of the government for August and led his Cabinet members and other senior officials to Sanamxay (district) to monitor rescue and relief efforts being made for flood victims," KPL said. Provincial authorities issued a call for emergency aid — clothing, food, drinking water, medicine, cash and other items — from the "party, government organizations, business community, officials, police and military forces and people of all strata." Laos is one of the poorest countries in Asia. It has transitioned from communism to a market economy but remains a single-party state where freedoms are limited. There is virtually no freedom of the press, and foreign reporters who visit operate under tight restrictions, limiting the flow of information. Electricity from several hydroelectric dams provides a large share of Laos' export earnings, with Thailand being a major buyer. KPL said the Xepian-Xe Nam Noy project cost an estimated $1.02 billion. Much of the financing came from Thai lenders. According to the website of the company that built and runs the dam, it is majority-owned by SK E&C and Korea Western Power. The Ratchaburi Electricity Generating Holding Public Co. Ltd of Thailand holds a 25 percent stake and the Lao Holding State Enterprise holds 24 percent. The dam was built to divert the Houay Makchanh, Xe-Namnoy and Xe-Pian rivers into reservoirs that feed into a 410-megawatt power plant that is due to begin operations in 2019. Only 10 percent of the power generated was to be used locally, with 90 percent exported to Thailand. Laos is supposed to receive taxes, royalties and other income estimated at $33 billion per year from the dam. According to project assessment documents, about 30 villages were affected by the project with more than 2,000 people in eight villages resettled. Roughly 10,000 people live in the affected area, with most belonging to ethnic minorities. The project was supposed to be a cash cow for SK E&C, a part of the SK Group, one of South Korea's top three conglomerates whose businesses include SK Hynix, the world's second-largest chipmaker, and SK Telecom, South Korea's largest telecoms carrier. South Korea's Yonhap News agency reported that SK E&C sent its president to Laos and set up an emergency team in Seoul. The company did not respond to several calls seeking comment. SK E&C was still trying to find out whether water had overflowed the dam or if the dam had collapsed, but efforts were mainly focused on rescuing people stranded by the flooding, Yonhap said.